This image, taken by the HiRise camera aboard NASA's Mars Reconnaissance Orbiter, shows the Curiosity rover's tracks on the Red Planet through Jan. 2, 2013. Curiosity's landing site is the dark smudge at left; the rover is visible as a bright speck amid the light-colored terrain toward the right of the image. The Red Planet ramblings of NASA's Mars rover Curiosity are clearly visible in a new image snapped by a sharp-eyed spacecraft. The rover photo, taken on Jan. 2 by the HiRise camera aboard NASA's Mars Reconnaissance Orbiter, shows the ground Curiosity has covered since landing inside the Red Planet's huge Gale Crater in August 2012. Curiosity's touchdown site, dubbed "Bradbury Landing" in honor of the late sci-fi author Ray Bradbury, appears at the left of the photo as a dark smudge — a scar left by the rocket-powered sky crane that lowered the 1-ton rover to the Martian surface on cables in a daring and unprecedented maneuver. 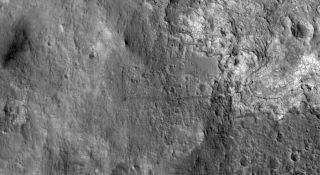 "The tracks are not seen where the rover has recently driven over the lighter-toned surface, which may be more indurated than the darker soil," HiRise principal investigator Alfred McEwen, of the University of Arizona, wrote in a description accompanying the new image. Curiosity's primary mission is to determine if the Gale Crater area has ever been capable of supporting microbial life. The rover carries 17 cameras and 10 different science instruments to aid this quest. Curiosity has already rolled through an ancient streambed where ankle-deep water flowed in the distant past, and it has spotted many other signs of long-ago exposure to liquid water in the Yellowknife Bay area. The mission team is currently gearing up to use Curiosity's drill for the first time. In the next two weeks or so, they plan to bore into a rock in a Yellowknife Bay outcrop called "John Klein." Curiosity's drill will allow scientists to peer 1 inch (2.5 centimeters) into rock, deeper than any Mars rover has gone before. While Curiosity has found plenty of interesting deposits close to its landing site, the robot's ultimate destination is the base of Mount Sharp, the mysterious 3.4-mile-high (5.5 kilometers) mountain that rises from Gale Crater's center. The many layers of Mount Sharp preserve a record of Mars' changing environmental conditions over time, and Curiosity scientists hope to read this history as the rover climbs up through the mound's foothills. Curiosity will likely head toward the targeted Mount Sharp deposits, which are located about 6 miles (10 km) away, after the rover wraps up its drilling operations in Yellowknife Bay, mission scientists have said.